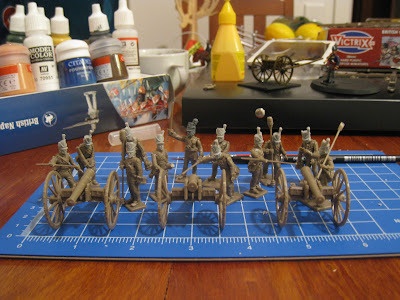 Well, any blog about Napoleonic wargaming was always going to have to include a comparison between miniature companies, so I suppose this was a long time coming! I managed to get some painting done today, not alot, just a few single miniatures. I then did a lot of assembling! Here is the comparison photo, on the left is a Perry skirmisher from the 29th company, and on the right is the freshly painted Highlander from the 71st Regiment of foot. Note that the Highlander has no kilt; because the 71st-75th lost their kilts in 1809; prior to the Peninsular campaign. They replaced them with tartan pants (classy!) 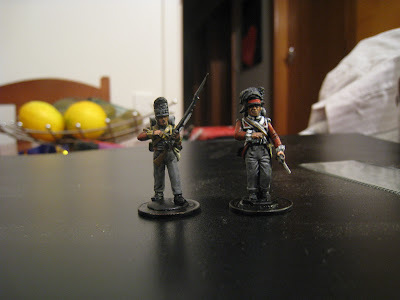 which I will hopefully replicate on a couple of the soldiers (definitly the officer!). The story goes that the tartan pants didn't last long on campaign, hence the grey pants for this skirmisher! His headband should also be white/red checked, but I gave it a go, and it really didn't work. So, thats why you get the red! The highlander is wearing the traditional scottish bonnet, which may also not be historic but... meh, it looks cool! The head is from the Victrix Highlander Centre Company box, the bodies are from the Victrix Centre Company box. I copied the idea (shamelessly) from Dave Taylor, check it out if you want to see where my ideas came from! Well, onto the comparison. I mentioned earlier how I thought the Victrix miniatures were a bit blocky. I thought my opinion might change when they were finished, but I am not convinced just yet! There is more detail on the Victrix models, but the execution is lacking- excess flash, flaky plastic. Right, too many words, not enough pictures. Here are the fruits of my afternoon's assembling while I was painting the solo Highlander! I have these, in addition to the rest of the Highlanders to go along with the skirmisher! The different heads come from the Victrix Centre Company box (plus one Perry head), because the ones that came with the artillery box are absolutely ridiculous! According to Victrix artillery crew spend all their time squirreling acorns into their cheeks, or at least thats how they were modelled! In the background is another little extra for the army, not a unit per-se, but will be useful for game play! Well done for reading that all, I suppose a good distraction from work? I promise more photos, less words next time.